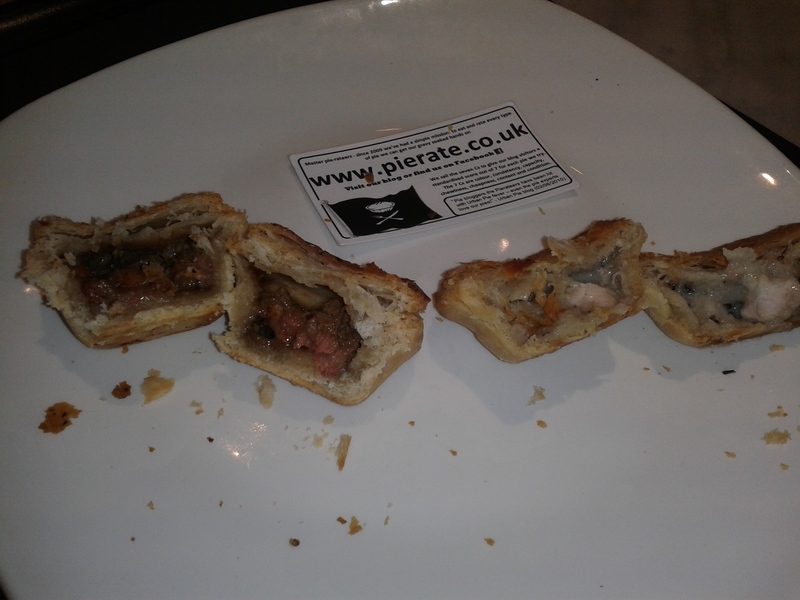 Square Pie are the friend of the pie fanatic, especially those who find themselves loosing their minds amongst the retail madness of the twin Westfield shopping centres London now finds itself with. What's more, you will find these pie establishments open until 10pm on some evenings. At this time there are unlikely to be any other restaurants still serving pies. The score of a pie is somewhat relative. For example a very hungry pie fanatic would find an average pie much more satisfying than normal. It is like this for Square Pie. When theirs are the only pies still available they are much more valuable. After all some pie scores infinitely more than no pie. So a late night trip to Stratford meant I naturally had to pay Square Pie a visit. I had been before of course as they were the location for our 100th pie review. Something new caught my eye this time. It seemed that there were some new mini pies on offer. They were called Canapies - which is so punny I am surprised we didn't come up with it. For sure these mini pies were cute but were they going to be satisfying? I picked up a Steak & Guinness and a Chicken & Mushroom at the £2.80 for two price. 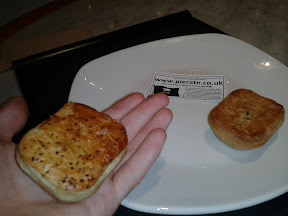 Quite good for London restaurant prices but these were very small pies. However, the Steak and Guinness seemed to have far too much pastry, in my opinion, which meant I could hardly even taste the filling, let alone tell you how good it was. It was also quite dry. The chicken & mushroom was fortunately a quite a lot better. It wasn't so dry and I could taste both the chicken and mushroom. However, I think format just doesn't work with these pies; there is just too much pastry to filling. Maybe if Square Pie made these slightly bigger we could have an ideal snack pie. No doubt the filling is very tasty when you have enough of it. If you do find yourself desperate for a late night pie, we think it's better to just go for the full sized options, which we have already found not to disappoint.